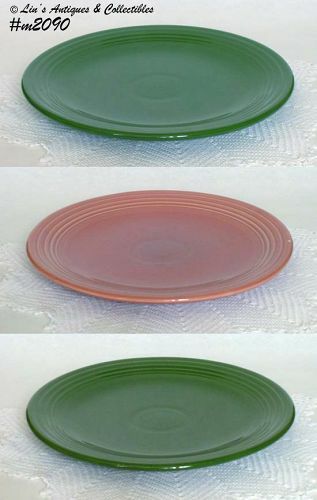 This listing has your choice of Fiesta chop plates. There are two dark green and one rose color. 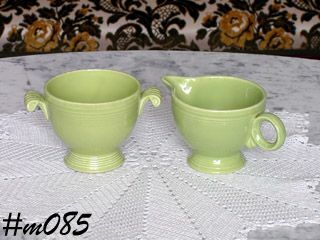 All are in wonderful condition with very minor utensil marks and the rose color has some production glaze imperfections. Green ones are $55 each, rose one is $60.00. 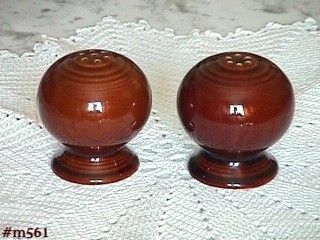 This is a very pretty Fiesta salt and pepper shaker set in a pretty warm brown color with shiny over-glaze! Shakers measure 2 1/2" tall are are round shaped with a short pedestal base. Shaker set has no chips, no dings, no cracks -- nice addition to a Fiesta collection! 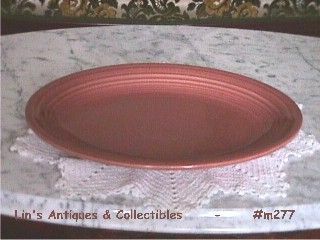 This listing has a vintage Fiesta serving platter! It's in the pretty rose color -- a 50s color -- and is in mint condition. Platter measures 12 1/2" x 10". This listing has a beautiful Fiesta creamer and sugar! The sugar does not have a lid. They are Chartreuse color -- a "fifties" color and both are in excellent condition!